According to the U.S. Bureau of Labor Statistics’ Division of Labor Force Statistics, the volunteer rate declined for the year ending in September 2015. Approximately 62.6 million people volunteered through or for an organization at least once between September 2014 and September 2015. 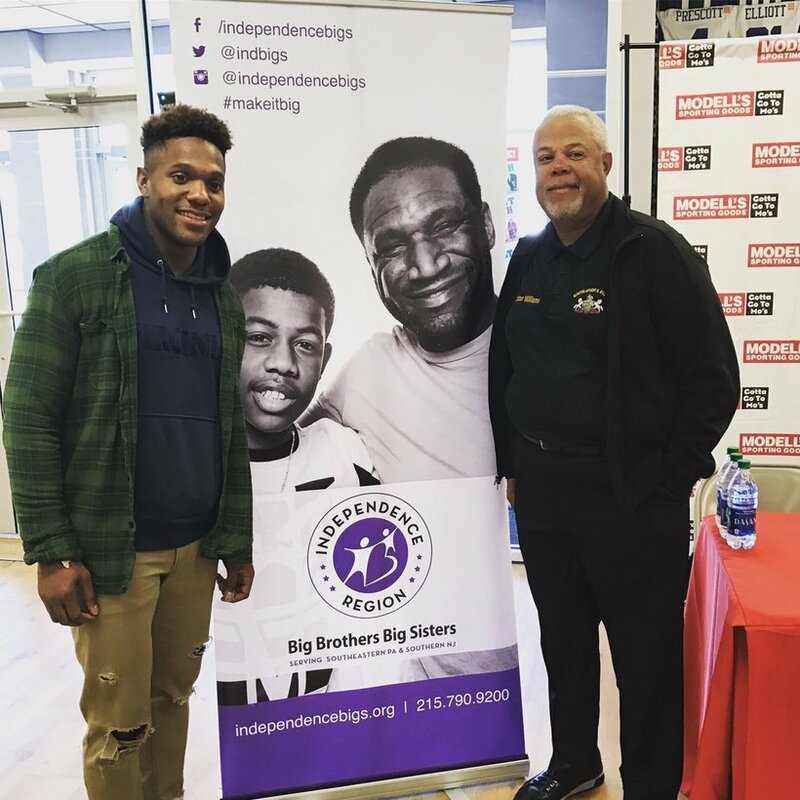 To increase the volunteer rates throughout the United States’ fifth largest city, NFL safety Rodney McLeod, Big Brothers Big Sisters Independence Region (BBBS Independence) and Pennsylvania State Senator Anthony Williams formed an alliance to register mentors while celebrating National Volunteer Month. Through McLeod’s “Mentoring Is Brotherhood Challenge,” the collective have set out to recruit 100 male volunteers and raise $5,000 to support youth mentoring programs, run by BBBS Independence, this month. BBBS Independence currently has more than 1,200 children signed up and waiting for mentors, with the majority being young African American and Hispanic. 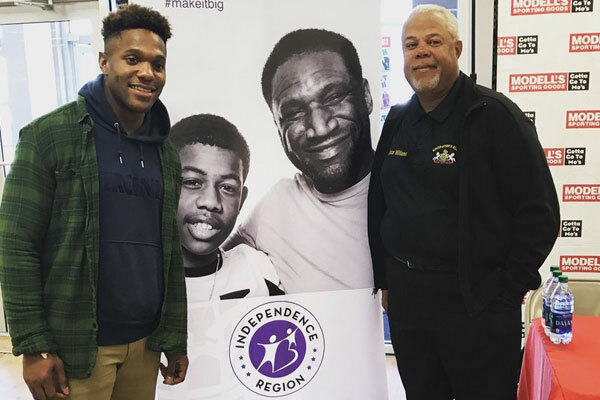 McLeod is working with BBBS Independence and State Senator Williams by challenging all men in the Delaware Valley, especially men of color, to step up and volunteer. “I think there’s a misperception that mentoring is a time consuming process,” said Marcus Allen, CEO of BBBS Independence. Thank you to Louis Bolling for the article. 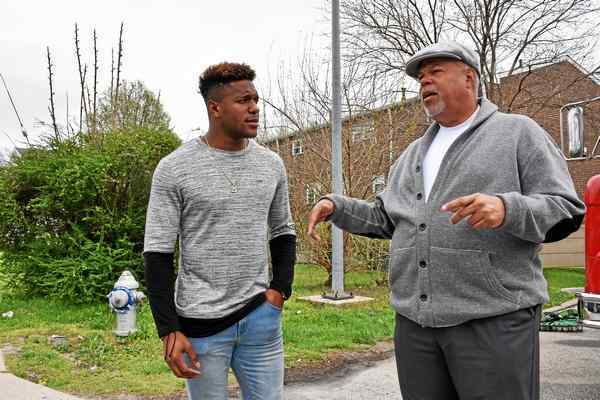 State Sen. Anthony Williams, D-8, and Eagles Safety Rodney McLeod are challenging men to volunteer and become Big Brothers. Both came to Darby Township Fire Station to recruit men during National Volunteer Month. Big Brother Big Sisters of America has more than 1,200 children on a waiting list for mentors. Eight hundred of them are boys according to Greg Burton, Vice President, Marketing and Communications at Big Brothers Big Sisters Independence Region. The Big Brothers Big Sisters program touches lives in Chester, Delaware, Montgomery and Philadelphia counties. The program also serves youngsters in Gloucester, Camden and Burlington in New Jersey. Williams and McLeod talked to the small crowd gathered at the fire house about the impact one can make on a youngster as a mentor. Williams stressed the need for men to step up within the community to help children. “We are recruiting men for young men. You may be at home, or at the mall or doing whatever you are doing, but at some course during your day, your week, your month or your year, you are going to come in contact with a young man who needs help. This is your opportunity to do something before he needs the help. Come out and sign up to be a Big Brother. It doesn’t take a lot of money and frankly it doesn’t take much time. What it does take is commitment of your heart and consideration for another generation,” said Williams. Luckily McLeod had both parents rooting for him and supporting him. “I always looked up to my parents. My mom and dad were always part of my life. They supported me to become the guy I am today; I feel it’s my duty to help other youth in the community. It’s much needed,” said McLeod. Two Big Brothers from Delaware County were on hand to answer questions and encourage other men to become involved in the Big Brothers Big Sisters program. Tom McElvogue of Wayne mentored six young men. One graduated from Villanova University and another from West Chester University. He is now mentoring a junior at Conestoga High School. He has been a Big Brother for the past 45 years. McElvogue also received the Big Brother of the Century Award from Big Brothers Big Sisters. “The one thing all the boys had in common was that they didn’t have a dad. A lot of people think, which is a misconception, that it is an inner-city issue,” McElvogue said. “All these kids don’t have a male mentor in their life. They don’t have any male to talk to. They are looking for someone to talk to, to give them direction and encouragement. It’s a simple process. It’s not rocket science. It has tremendous results. They become productive members of the community. Dan Ruppert of Aldan knows how important it is for boys to have a male mentor in their life. His dad suffered from a stroke. Today he volunteers as a Big Brother. His Little Brother lives in Glenolden. “I had the luxury of having several surrogate fathers in my life,” Ruppert said. “My father had a stroke when I was very little so I didn’t have the luxury of having a dad to play ball with, but in my neighborhood I had three friends’ dads who really took me in and mentored to me. They took me to ball games and all the good stuff and guided me when I was older. There will be two more upcoming recruiting events for Big Brothers in the area: April 21 outside of FOX29 Studios and April 29 at Modell’s at 246 S. 24th Street in Philadelphia. For more information about the Big Brothers Big Sisters program go to www.independencebigs.org. 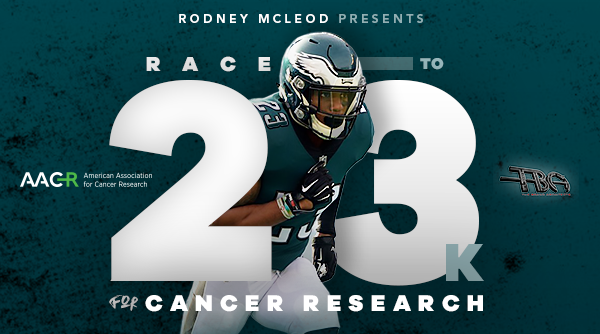 Rodney McLeod teamed up with Shriners Hospitals for Children to host his second annual Shriners Hospital for Children–St. Louis Halloween Huddle at America’s Incredible Pizza Company, where McLeod told his own personal story of making it to the NFL and played games and other activities with the children. But before he and the children could go play games, he needed to complete his “Shriners Initiation.” Madelyn, one of Shriners patients, taught McLeod how to tie his shoes with just one hand. McLeod had a tough time meanwhile Madelyn tied her shoes in less than 30 seconds, and then had to tie his shoes for him. 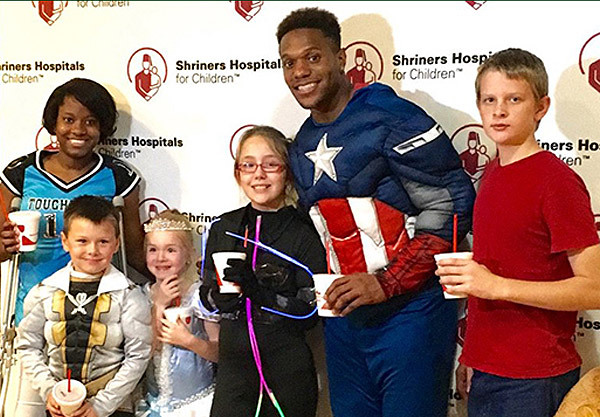 All of the children in attendance were in Halloween costumes as was McLeod who traded in his street clothes for a Captain America costume. The Rams’ starting safety and children played air hockey, mini-golf and drove go-carts throughout the afternoon. Check out pictures from the event in our media gallery. 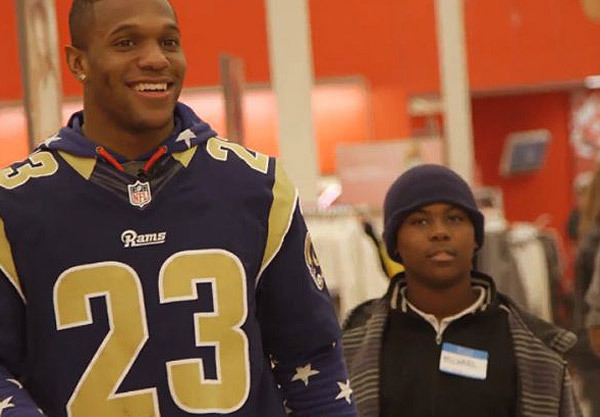 The St. Louis Rams Cheerleaders, Rampage and Rams safety Rodney McLeod help out the Salvation Army by helping kids shop for their very own Christmas gifts.